AN eight-year-old girl is still fighting for her life in hospital after allegedly being stabbed as she slept. The youngster was attacked in the early hours of the morning in her bedroom in Danube Street, Stockbridge. Police are waiting to question a 48-year-old woman – believed to be the girl’s mum – who has been reported to prosecutors. She is also being treated in hospital for knife wounds which have been described by police as “serious but not life-threatening”. Forensic experts remained at the £1 million townhouse on Thursday – more than 24 hours after the incident around 1.30am on Wednesday. They scoured the property for evidence as neighbours struggled to come to terms with the horror. One woman, who asked not to be named, said: “I was at the Sick Kids hospital when the little girl was brought in and it was the biggest rush of doctors and nurses I’d ever seen. “I had been there since just after midnight waiting to see a doctor with quite a lot of other people. “A nurse ran through and opened the doors around 2am and asked parents to keep their children close as an emergency was coming in. “Numerous nurses and doctors were all running to the resuscitation room and within a few minutes the ambulance arrived. The girl was sped down the corridor as fast as the ambulance crew could run. “I felt physically sick with fear. I just hope she pulls through – it’s tragic. Police were called to the address at around 1.35am on Wednesday where the schoolgirl was found with serious injuries. Neighbours said the girl had only lived at the address for the past few months. Another resident who asked not to be named said: “Nobody really knows for sure what’s happened. “It’s not really our place to comment. The woman only moved into that house during the summer – I don’t think anyone around here knew her particularly well. A spokesman for Police Scotland said: “Police in Edinburgh were called to an address in Danube Street around 1.35am on Wednesday. An eight year-old girl was found with serious injuries. “She was taken to the Royal Hospital for Sick Children where she remains in a critical condition. “Specialist detectives are currently supporting her family. 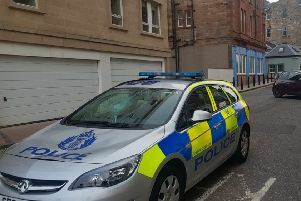 “A 48-year-old woman was taken to the Edinburgh Royal Infirmary after also being found seriously injured within the address. A spokesman for the Crown Office confirmed the procurator fiscal has received a report concerning a 48 year-old woman in connection with an alleged incident in Edinburgh on December 7.